Mark your calendar for Feb 14/15! 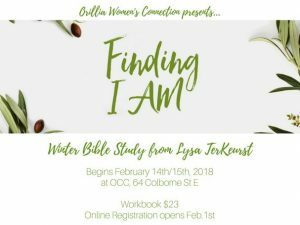 That’s when our Winter Bible Study will begin, and this year we’re doing “Finding I Am” by Lysa TerKeurst. The ache in your soul that keeps you up at night? with 2 weeks off (March 14/15 & 21/22) for March break & Journey to Israel.